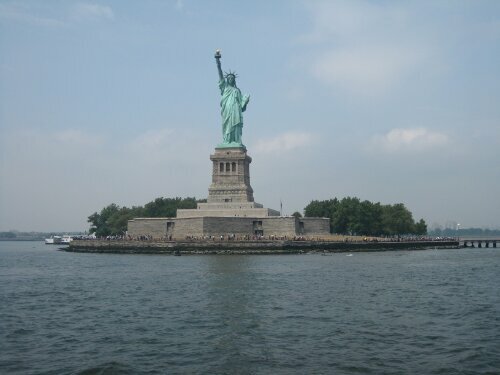 2 summers ago, I saw this lovely lady from a boat tour of New York. She brought tears to my eyes. She symbolizes how lucky I am to have been born in this amazing country. I know our country isn’t perfect. Really, what is perfection anyway? I was raised in a middle class home in a small city. There was always food on the table. There were summer vacations. I didn’t know what bills were. My parents worked hard. We always ate dinner together. My parents were both home every night when I went to bed. The only gunshots I ever heard were from a gun club that happened to be a few miles away. When I was 6 years old, it was perfectly safe for me and my friends to walk to and from school without our parents without any fear. There aren’t trucks full of machine gun toting men driving up and down our streets. We live in a safe country. A happy country where you have opportunities to be and do whatever you want. You have the right and freedom to speak your opinion as a man or a woman without being stoned. As I got older, I have visited beautiful places that reminded me of the true natural beauty of our country. The Grand Canyon is the most amazing thing that I have ever seen. Pictures will never do it justice. Acadia is such raw nature and I feel so lucky that it is so close. There are so many other locations that this country has made a point to preserve to remind us what we were, what we stand for and what is important. Places that I hope to visit some day. Yosemite National Park was closed on her 123rd birthday yesterday. This not only makes me sad, it also makes me angry. I am not a political person. If politics come up, I usually quietly exit the conversation. Today is different. What is going on right now is horrifying to me. This shutdown was unnecessary. Why don’t we have any checks and balances to avoid this? Large corporations are required to have auditors. This country is a bad investment as a business. I don’t know what we stand for anymore. The land of the free and the brave? My country tis of thee? Who are we? What are our goals? What is our plan? Why are we spending all of this money all of the world and shutting down our national parks and monuments? What is the mission statement of the United States of America? The Sierra Club has a way for us to talk to congress. Please take a minute and fill this out and tell everyone you know to do the same. Let’s remind the people that are still getting paid what is important to our nation! Urge your member of Congress to fully fund the government without toxic add-ons and open our parks and public lands back up! Take the time today to exercise your freedom of speech!